Editor’s Note: Michael Johnson of Lansing, Michigan, started racing motorcycles with his father when he was only three years old. 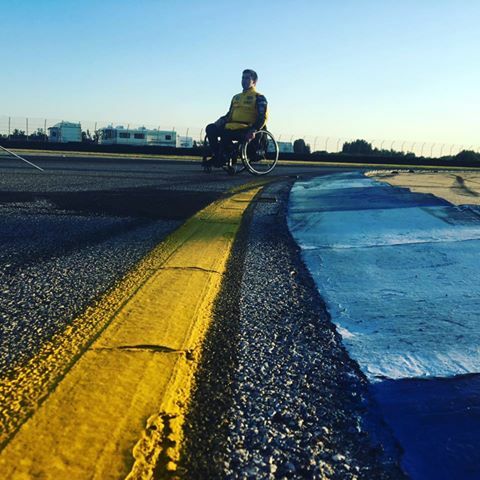 In 2005, he suffered a traumatic accident in which he broke his back during a race, leaving him paralyzed from the mid-chest down. 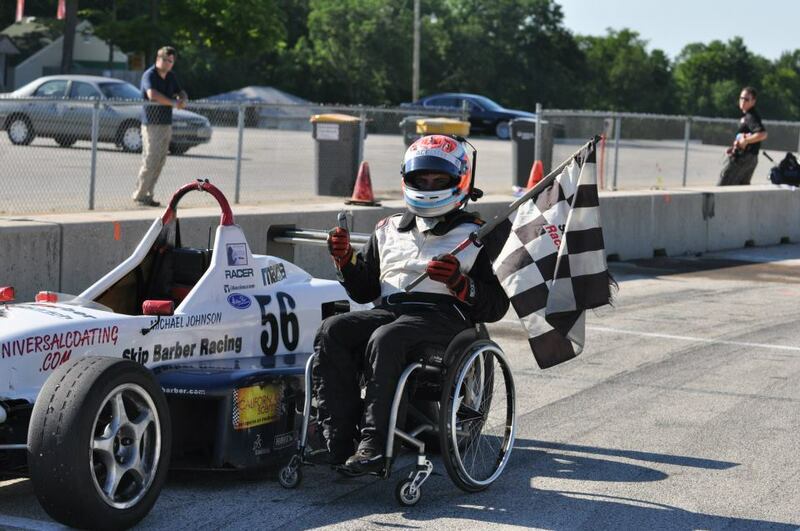 After adjusting to his new normal, he found his way back to racing, this time in a go-kart. 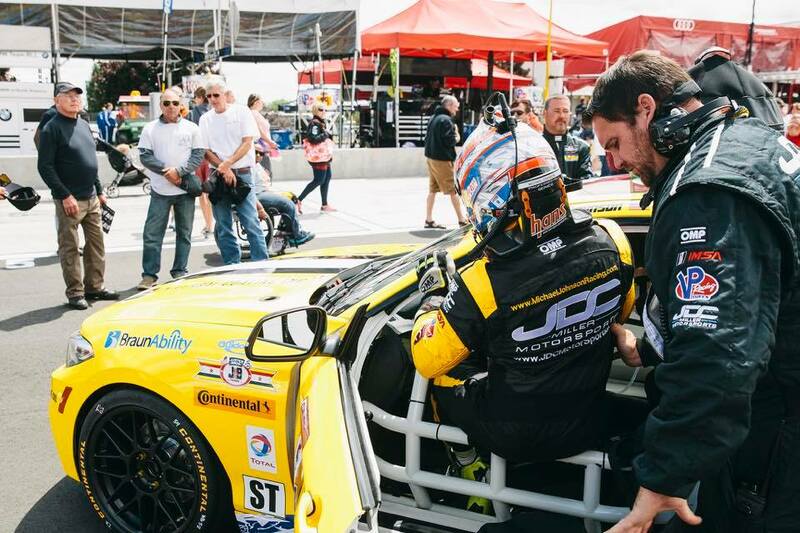 As his passion evolved, he moved to racing cars in 2009. 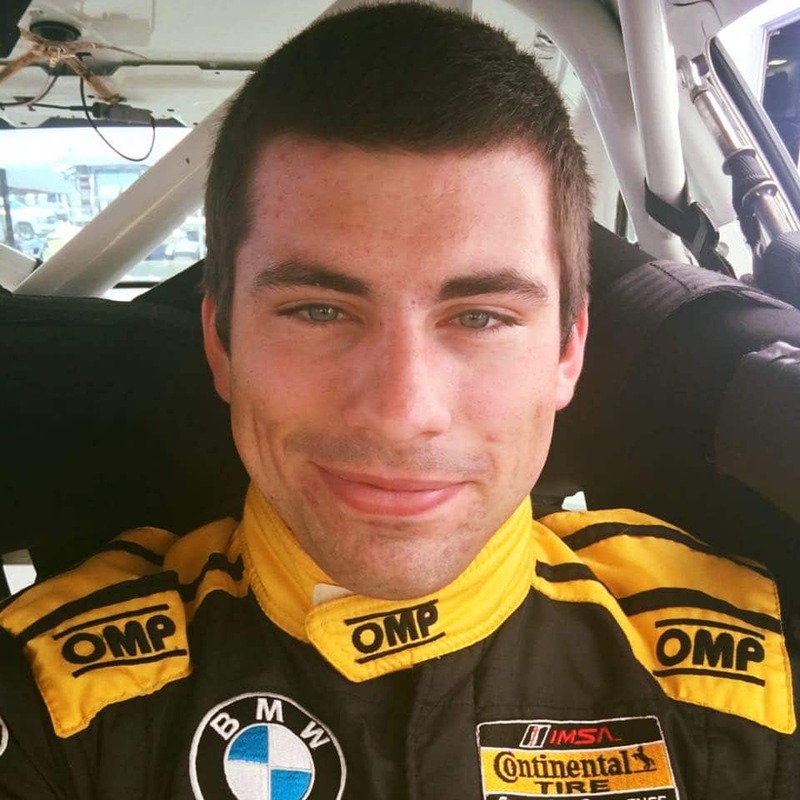 This summer, at 24 years old, he’s gearing up for a slew of North American races while keeping his eye on his long-term goal: the international circuit. I was really young when I had my accident; I was just about to go into 7th grade. I kind of lost my teenage years because of it and had to grow up really fast. 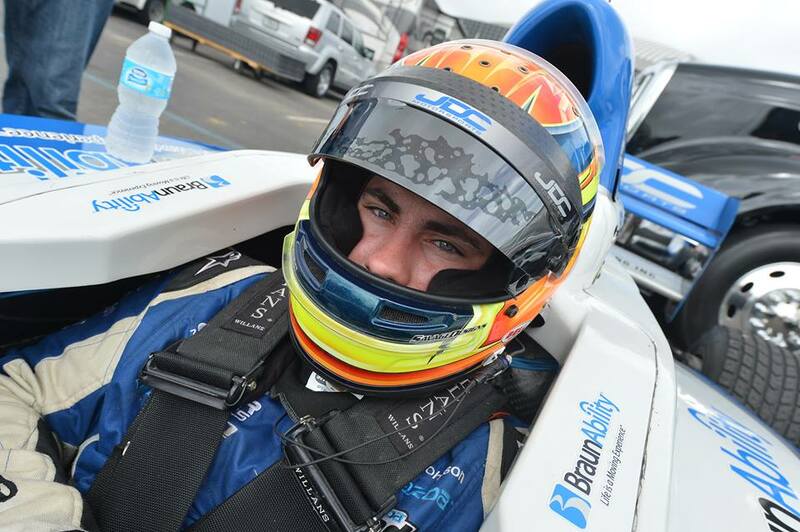 I didn’t really know what was going to happen next, but I knew I wanted to continue racing and just living life. Luckily, my parents were there to help coach me through everything. They supported me every day by going to all the doctor appointments with me and teaching me how to live, learn, and function on a daily basis again. My parents attended a seminar given by Dr. Carlos Lima, who did my initial surgery after my accident in 2005. They talked to him about a new surgery for spinal cord injury patients that looked very promising. We convinced him to allow me to get the surgery in 2009 when I was 17. We had to go to Portugal to get it done because it wasn’t approved in the US yet. The process involved taking stem cells from my brain and injecting them into the damaged area of my spinal cord. In theory, those cells retrain the impaired nerves to work again. Since the surgery, I’ve gained quite a bit back in terms of sensory feeling. I can feel vibrations. If you tap my knee bone, I can feel that, but I can’t feel small things like if you lightly brush my skin or pull my leg hair. We don’t really know how much of those gains are from the stem cell surgery and how much are simply from time and working out. 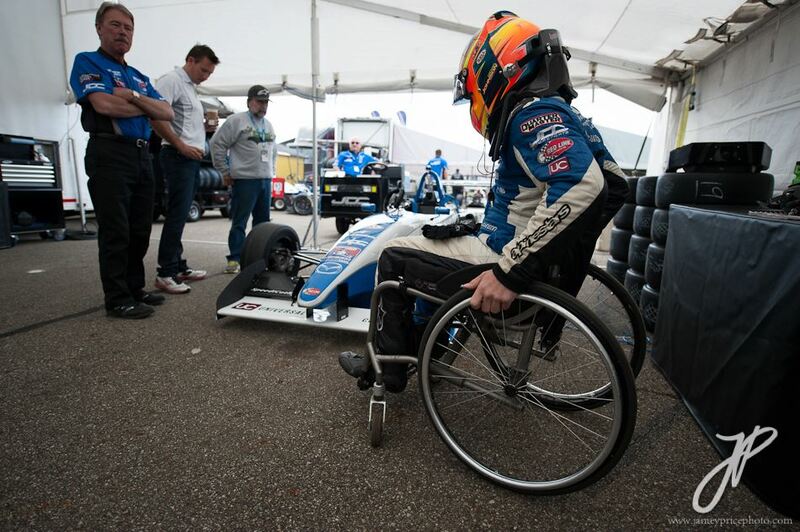 Being able to feel vibrations is a huge plus in racing. Everybody says you can feel everything through the seat of your pants, but since I can’t do that, I’ve learned how to feel through my hands on the steering wheel. The vibration of the car is transferred up through my body to my hands, and that’s how I can tell what’s happening. I’ve been with my current trainer since my stem cell surgery. He goes to all the races with me. He knows my legs really well. He knows if they’re having a good or bad day, and he knows how to really work with my body. We train four to five days a week and do a lot of cross-training, cycling, swimming, and low-weight, high repetition exercises. I don’t want my upper body to be too bulked up because I try to keep it proportional to my lower body. There’s a minimum weight for all racers, so the closer you are to that minimum, the more you can add weight to other parts of your car to find your ideal configuration. I train as much as I can to make sure I’m as physical and competitive as everyone else is on the track. Racing involves a lot of coordination. There are so many controls on the steering wheel and numerous tasks you have to do simultaneously. While I’m doing tedious physical exercises, my trainer will throw math or spelling questions at me. This forces me to use my brain while I’m doing the exercise. It’s especially important to work on this when I’m exhausted physically because it mimics an actual race. 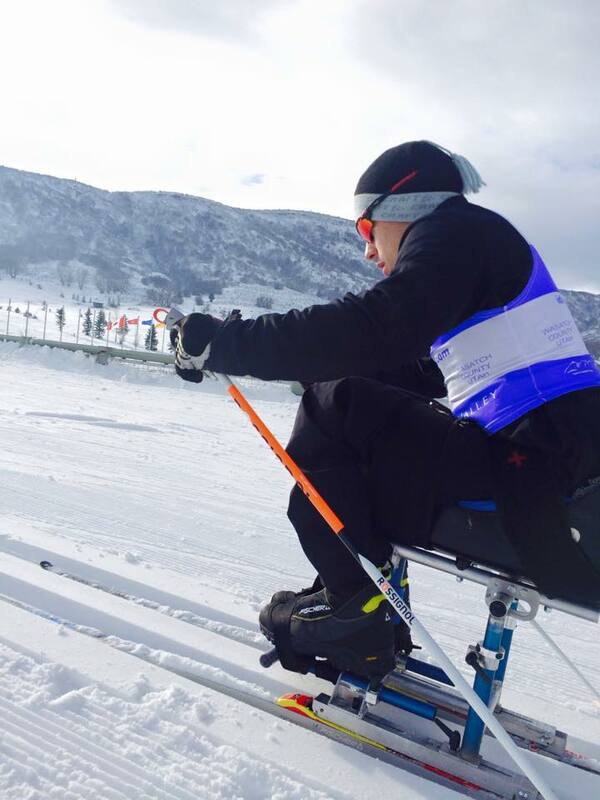 We train a lot in order to be our best during long races. The more physically and mentally fit we are, the better we’ll be on the track. 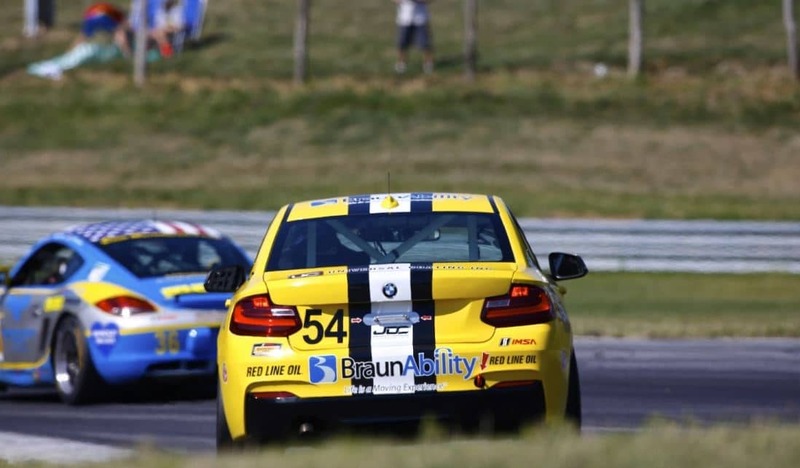 The type of racing I do is called endurance racing. We compete with teams, and depending on the race, they last anywhere from two hours up to 24 hours. In general, I do the two-hour races. I’ll do the first half of the race, then we do a pit stop to change tires, fuel up, and switch drivers. My teammate then finishes the race. My current teammate and I have been racing together for the last two years, and he was my coach before that. Our busy season is starting up, and we’ll be racing all the way through October. I’m feeling good and am excited to get back into the car. My future goal is to race professionally over in Europe. I’d love to be able to travel from country to country and do what I do best. In order to do that, it’s important to gain a lot of experience, which is what I’ve been doing the last few years. 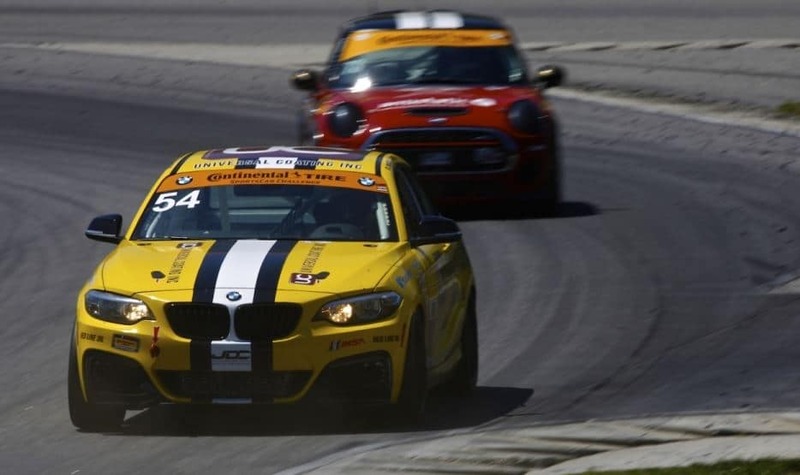 The more I race in North America, the more experience I gain and the more exposure I get. If I can get myself out there and make myself known, I’m more likely to get sponsors and funding. Without money, I’m not going anywhere. I’m currently sponsored by a big company out of Indiana called BraunAbility who manufactures wheelchair lifts and accessible vehicles. FreeM, a suit manufacturer, and Arai Helmets are also on board, as well as my dad’s company, Universal Coating, who is my major supporter right now. I’m keeping my brain active by going to school as well. I’m studying marketing with the goal of understanding the work my manager does to promote me. Eventually, when I retire from racing, I’d like to own my own team. The biggest thing that I tell people with a new injury is to hang in there; don’t give up. It will get easier. Some days you’ll have it bad, and some days will be much better. If you give up, you give up on yourself, your friends, and your family. Find a goal to go after that keeps you busy and active. Racing helped me. It was my therapy. Just try to enjoy the life you have, because it could always be worse. Try and live your life like you would if you were walking. You’ll have to make a few changes, but it’s not the end of the world. Focus on something that makes you enjoy life. SpeediCath® Flex Coudé – order free samples now! The new SpeediCath® Flex Coudé is here! The flexible tip and softness of the catheter tube makes it easy to handle and enables safe and gentle passage through the urethra. 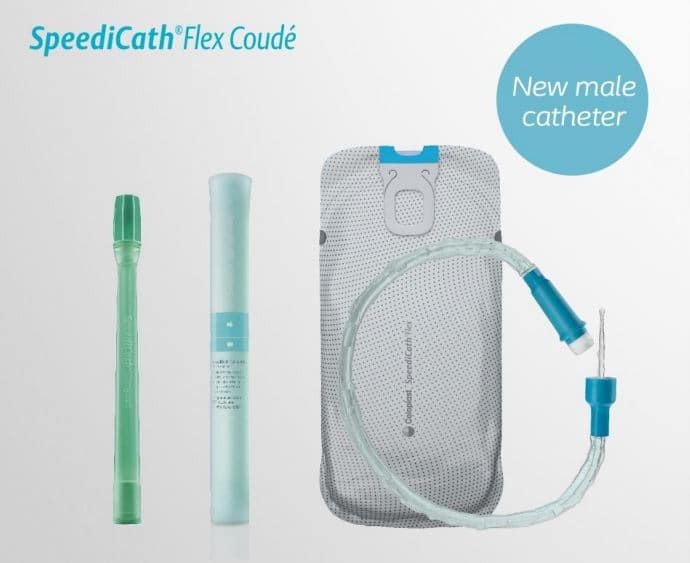 Try SpeediCath® Flex Coudé today and discover how easy it can be to cath with the new SpeediCath® Flex Coudé!